The great thing about getting a different produce box every week is that I don't have to really think about what to buy at the grocery store, and it keeps my creative juices flowing. I got 4 large red bell peppers from Imperfect Produce, and I couldn't stop thinking about making a some sort of sauce. I'm a sauce person...you all know that by now! I was thinking a creamy red pepper pasta sauce, but then I remembered I made romesco sauce YEARS ago. I also remember me loving it, and Sushil not LOL. I decided to give it another whirl anyways. This recipe uses a few things that were already in my pantry minus a couple ingredients that are traditionally used to make a romesco. I left out the bread, added chipotle, subbed plum tomatoes with tomato paste, and instead of blanched almonds went with almond butter. By now you are thinking that I've deconstructed this romesco to the point where I should just call it something different, but I'm not. It really tastes like romesco I've been served at restaurants. It's freaking delicious, and it will pair well with meat, fish, or vegetables....PROMISE! Preheat oven to 450 degrees. Cut red bell pepper into quarters and remove seeds and ribs. Once oven is preheated place red bell pepper on a baking tray and coat with a little bit of olive oil, salt, and pepper. Bake for 10-15 minutes until all sides are slightly charred. Flip halfway through. Remove, and set aside to cool. To make romesco sauce blend all ingredients until smooth. Adjust seasoning if necessary. Turn down oven to 400 degrees. 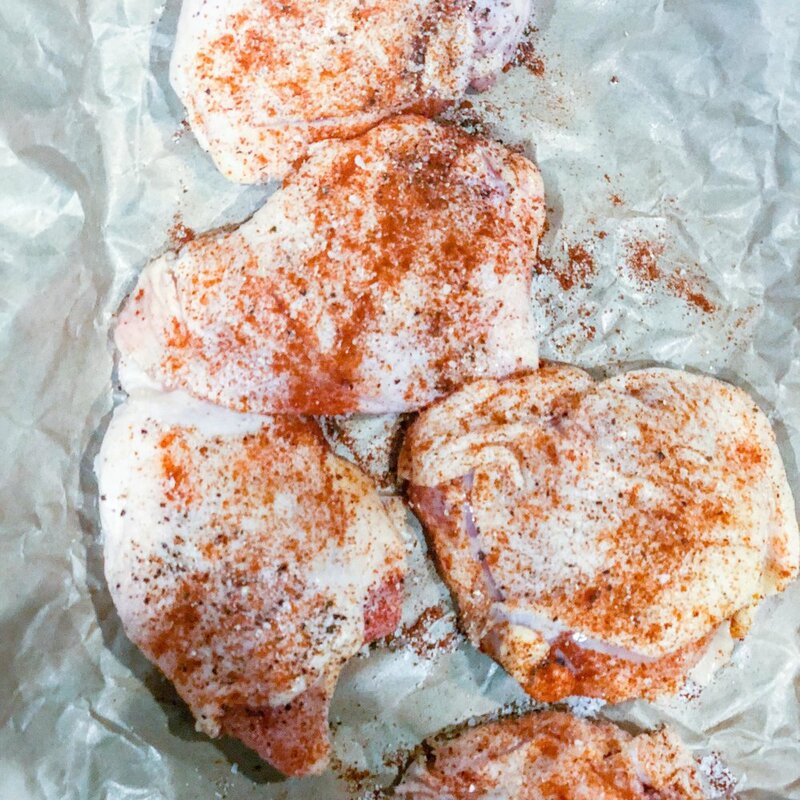 Liberally season both sides of chicken thighs with salt, pepper, and paprika. Coat the bottom of a cast iron skillet (or heavy bottom pan) with oil, and heat on the stove top. Once the oil is hot place chicken skin-side down. Flip chicken thighs after 5-7 minutes or when skin is golden brown and crispy. Using a brush or the back of a spoon coat each chicken thigh with romesco sauce. Place in oven for 15-20 minutes or until chicken is cooked through (no longer pink and juices run clear). Serve chicken with rice flavored with lemon and parsley, roasted vegetables, olives, and romesco sauce!